Members of the DAR from South Carolina traveled to Washington for the Continental Congress. 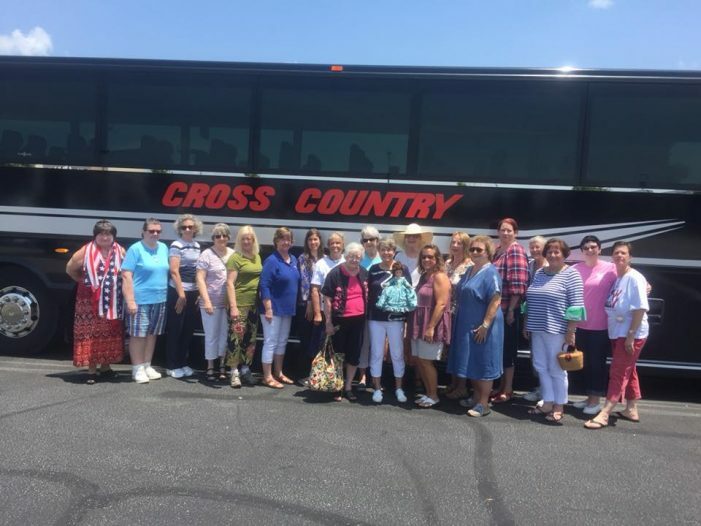 The bus pulled off early on Monday June 18th, with members of the South Carolina Daughters of the American Revolution onboard and eager for a memorable journey to the Nation’s Capital, Washington, D.C., for an annual event, known as Continental Congress. The DAR Continental Congress draws members from across the country and abroad. The name, Continental Congress, reflects the historical body that governed the colonies during the Revolutionary War. This year marks the 127thnational meeting. Many ladies make plans to attend every year. This was my first time to attend, at the encouragement of my good friend, Kelly Hagens-Swart. Both of us are members of the Old 96 District Chapter of Edgefield, South Carolina. Kelly serves as Vice Regent of the chapter, organized in Edgefield in 1914. The bus ride was enjoyable as there were many friends, old and new, to share the anticipation. At dusk, we arrived at the historic Willard Intercontinental in downtown, D.C. The warm, guilted interior was a welcome site to the group of travelers. Tuesday morning, the bus again pulled away for a day of adventures at the DAR headquarters, where Continental Congress is held. The three buildings that encompass the national headquarters include a concert hall, museum, and library. Elegant Corinthian columns flank several portions of the buildings. Two of the three buildings are designated as National Historic Landmarks. The museum and library are free to visit and open to the public. Immediately upon arrival, the excitement was notable. Upwards of 3,000 DAR members attend annually. With all the activity, it was wonderful to have a few friends to show me around the grand facilities. Along the corridors were educational tables offering items for sale to support DAR affiliated schools and iniatiatives. The DAR directly supports 6 schools across the country. In South Carolina, the Tamassee DAR school, founded in 1919, remains active as a children’s home, providing education and family service support for the community. The library is not only architecturally impressive, it is also unique, focusing on genealogical research material. Period rooms and the museum celebrate early period of American home life. Below the concert hall were outside vendors displaying elegant jewelry, hats, clothing and shoes. At the core of this building level was the Page Lounge. This series of rooms and lockers is the headquarters for all Pages, women between the ages of 18 and 41, who provide invaluable support to all events throughout the week. This past week, I served as Page to the Communications Committee, while Kelly served as a member of the committee. The number of Pages in attendance was over 400. What events go on at Continental Congress? Each day is divided into Morning and Afternoon and business sessions, luncheons, and evening events. This year, voting took place for Vice Presidents General, and installation ceremonies were held for new State Regents and State Vice Regents. Awards were given for a variety of members and to the public, such as achievements in history, patriotism, and support of junior membership. Pages were invited to choose which sessions they wish to help with and the work is always exciting. It was an honor to carry a state flag to the platform in front of hundreds of guests at a time. Another experience I enjoyed was participating in the Honor Guard to form a beautiful display along the aisle for the distinguished members to pass through. Other duties included helping anyone that asked for assistance, whether it was finding a particular room or answering questions about the social media available during the week. The Constitutional Convention makes many efforts to communicate to the many events through social media. This year included live streaming of business sessions, an App for your mobile device, blog and a daily publication providing a summary of the day’s events. The DAR motto, “God, Home and Country” is an accurate description of the spirit within the walls of the headquarters this past week. There were a variety of awards presented that support this motto. The warmth and vigor of the general spirit at times felt over-whelming with the sense of humanity, displays of friendship for members, veterans, and like-minded citizens. The spirit is also one of service. These ladies display an enthusiastic vigor for service that is very inspiring. The busy days made for many opportunities to meet new friends, learn more about the missions of the DAR, and enjoy seeing the Capital. To top off the week of patriotic endeavors, a group visited George Washington’s Mt. Vernon estate. This was the first time for all of us. I was unprepared for the beautiful setting of the elegant home. The grounds and out buildings were expertly maintained, the house tour was informative, and historic interpreters work the farm in period clothing. The experience was wonderful and I am already planning my next visit! After much anticipation, I can say that the week was memorable and heart-warming. George Washington set an example of humble service at the fore front of our Nation’s history. I encourage you to study the patriots of the past, especially any you may have in your ancestry. Since I have begun studying my own family history, I have a greater appreciation for veterans of all wars and a love of country that continues to unite us all.